Calling all hot sauce lovers! There was a place that I discovered this weekend that has set the bar for what hot sauce is all about. Pepper Palace, located at 23 North Boulevard of the Presidents, in the famous St. Armands Circle of Sarasota, is the place to shop if you want to expose your taste buds to a diversified selection of hot sauces, wing sauces, honey, jellies, butters, and more. Being a regular to the Circle, I noticed this place open a few weeks back. After talking to one of the employees, I found out it opened about six weeks ago. I had been meaning to check it out since, after all, I LOVE spicy foods and hot sauce. Stepping foot inside this place put me in hot sauce heaven. Shelves full of a huge variety of hot and wing sauces flavors grabbed my eye and I started sampling right away. The cool thing about Pepper Palace is how they have so much confidence in their product that they allow you to sample the many flavors. They have buckets of chips, breads, and other “dippable” foods for your consumption. What I also appreciated was that one of the employees came up to me and gave me his opinion on some of the sauces. He recommended that I try the Garlic Parmesan wing sauce, saying that the owner had made a dish with this sauce a week prior and it was delicious. And delicious this sauce is. I decided to get a bottle and as I was cashing out, the cashier told my girlfriend and I that if one of us went to the front of the store and yelled “Pepper Palace is AWESOME!” that we would receive a free bottle of hot sauce. So, my girlfriend went to the front of the store and shouted to the masses and we walked away with not just one delicious garlic-parm wing sauce, but a free bottle of hot sauce as well. But, wait, there is MORE. After I completed my transaction, the cashier offered us a bowl of a spicy Frito pie that she had in a warmer on the counter. She served each of us a bowl (and not just a sample, but a good size bowl) of this concoction and it was absolutely amazing. Now, Pepper Palace is a bit of a “chain,” but this is the only location in southwest Florida. The wonderful selection of sauces, combined with the helpful, friendly, and gracious service I received, left me with a great feeling about this place. I will absolutely visit Pepper Palace in St. Armands again. The people that work here are as great as the product that they sell, making this a very enjoyable shopping experience. 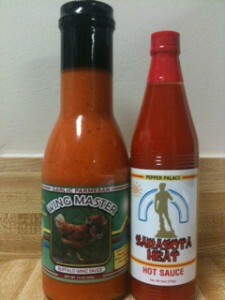 I recommend that if you’re a hot sauce, spicy foods, cooking enthusiast, etc.– CHECK OUT PEPPER PALACE! Contact Andy Richardson, Realtor, Suncoasteam Realty 941-276-5997 or car@suncoasteam.com if you are interested in Real Estate in Sarasota, Florida.